Dynamic yet refined, the C-Class Executive SE Estate now features the new grille with integrated star set within stylish bumpers and headlamps. It is further enhanced by LED daytime running lights – a perfect complement to the Saloon’s distinctive LED tail lights. Attractive 16” alloy wheels provide added visual impact. Inside, upholstered in Artico leather and both the 12-button multi-function steering wheel and gearshift lever are trimmed in nappa leather. High-gloss black trim is an elegant and understated finishing touch. Amazingly equipped, the C-Class Executive SE Estate includes Parktronic with Advanced Parking Guidance, and cruise control with variable speed limiter. 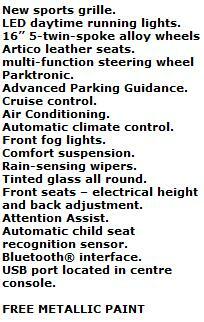 All Mercedes C220 CDi Estate car offers are based on 8,000 miles pa, 3, or 6 in advanced followed by 47 or 35 Payments. 2 Year Lease Also Available. For more information call us on the number below.